Alter Bridge guitarist Mark Tremonti was asked to name who he thinks is the most underrated guitarist in history. With the political heat being turned up in the States,the turmoil has been reflected in a lot of the music and art being released today. 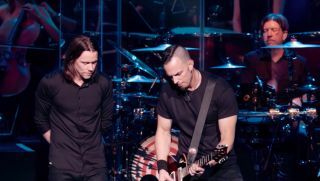 Alter Bridge have teamed up with RevolverMag.com to premiere the official music video for "Cry of Achilles," a song off their latest album, Fortress. Alter Bridge/Creed guitarist Mark Tremonti has just debuted the latest video from his debut solo effort, All I Was. This week, Alter Bridge/Creed guitarist Mark Tremonti kicked off his first-ever solo tour in support of his solo debut, All I Was. Creed/Alter Bridge guitarist Mark Tremonti has announced a July 17 release date for his debut solo album, All I Was. Mark Tremonti is now streaming the first single off his upcoming debut solo album, All I Was. Creed/Alter Bridge guitarist Mark Tremonti has set a July 10 release date for his debut solo album, All I Was. The record will be released via Tremonti's own Fret 12 Records.